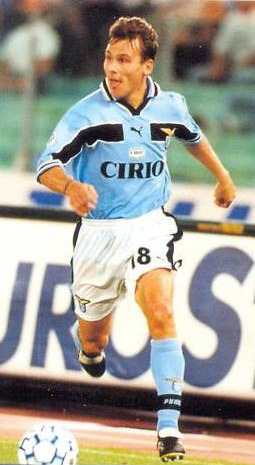 Photos of the world-class midfield of S.S. Lazio, 1999-2000. They were the key to the Serie A championship. Fluid and controlling the pitch, making the breaks, the midfielders contributed 25 goals this season. 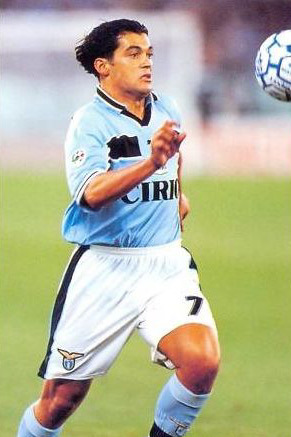 Lazio 2000 photos on celebrazio.net: Goal and Champion celebrations; shots of Czech Pavel Nedved; captain Alessandro Nesta; focus on the Lazio Forwards; focus on the Defense; close-up on the Midfielders; the "Bomber of Borovo" Sinisa Mihajlovic; assorted Lazio in Action; Chilean team leading scorer Marcelo Salas; others of Coaches, Keepers, and Extras; Argentina's Juan Sebastian Veron; scenes from the Day of Champions; and players wearing the Scudetto. Veron's nickname is "la Brujita" (the little witch), for his magic on the field, as well as a tribute to his father, who played soccer with the nickname "la Bruja". This play was an example of pure magic. 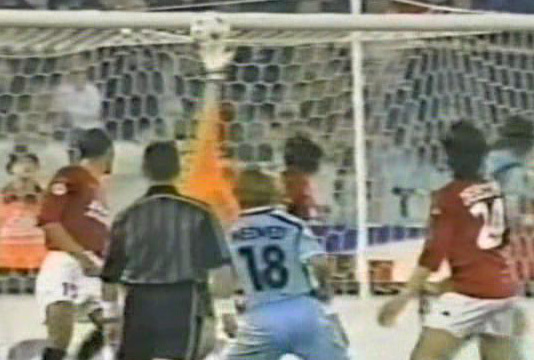 A corner kick by Veron, against Verona - the direct kick curved into the net untouched - goal Lazio! 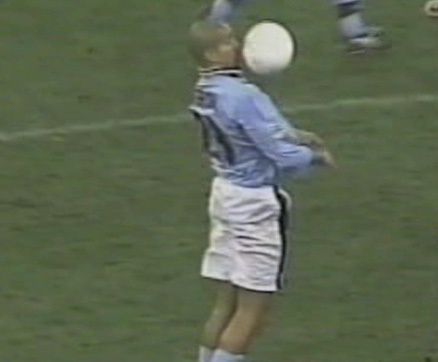 Veron in action - his trademark was ball control and passing. And low socks. 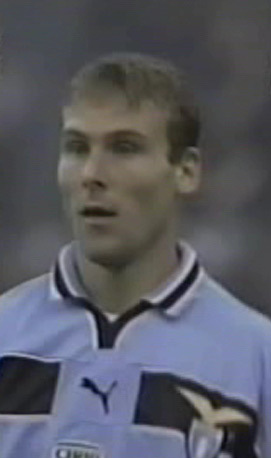 Pavel Nedved tallied 5 goals during this winning campaign. 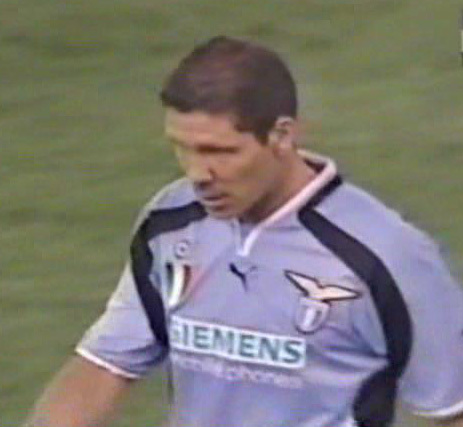 Simeone is shown here in 2001 wearing the prize: Scudetto-jersey with the Coppa Italia badge as well. Simeone's clutch contribution - the biggest of many - came in Turin with Juventus unbeaten at home and leading by 6 points in the race. 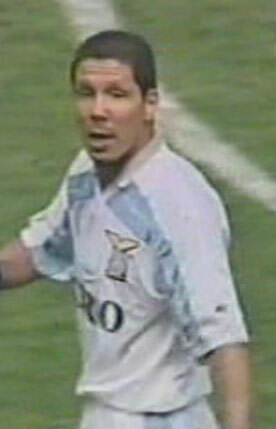 After Ferrara picked up a 2nd yellow card for Juventus, Simeone got his Golazo. 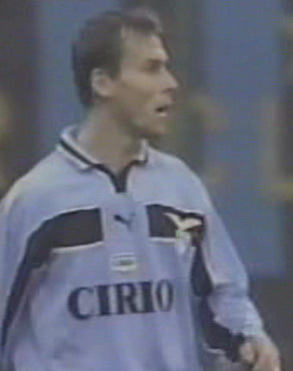 His first-ever goal in a Lazio uniform, beat Van Der Sar, and gave Lazio all 3 points that day. 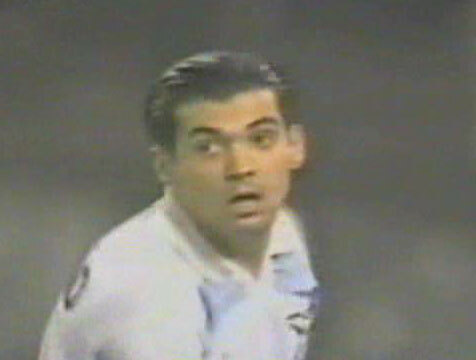 Sergio Conceicao has 2 goals in the winning campaign. Team celebrates with Veron after scoring against Roma. Nedved and Veron discussing the upcoming free kick. 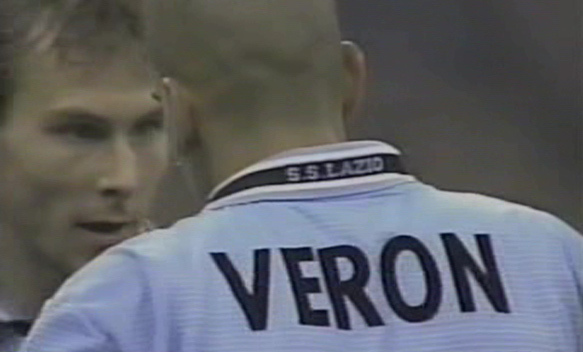 Veron celebrates his corner kick goal at Verona. 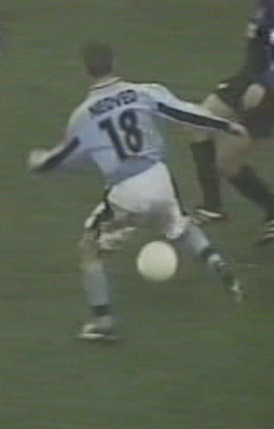 Nedved against Parma - shot on goal. 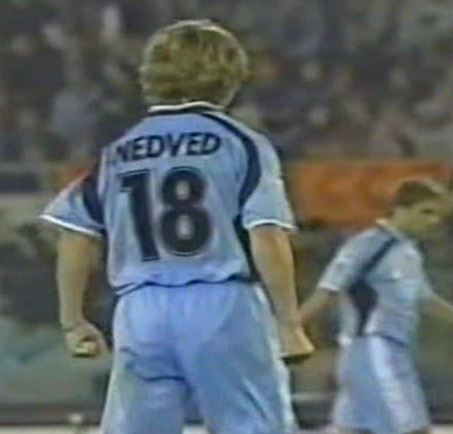 Nedved in action again. 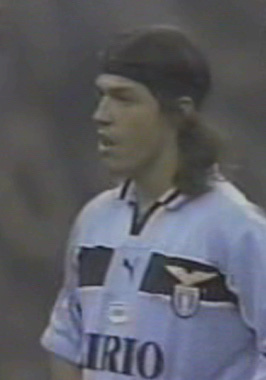 A dynamo, he later played several seasons for Juventus. 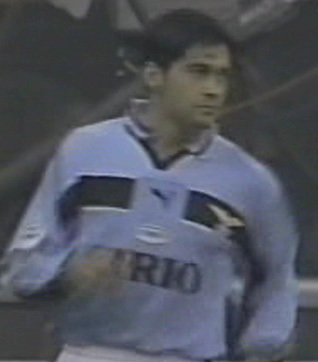 Stankovic contributed 3 goals to the campaign. He went on to captain the Serbian National Team. 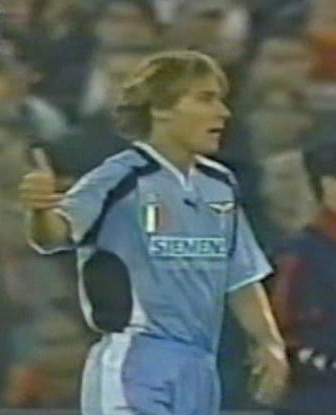 Nedved after his goal against Roma. 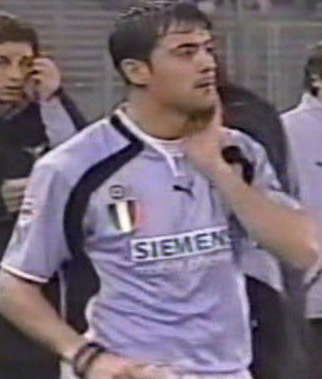 In 2001, the team sported the Scudetto on their jerseys, along with the Coppa Italia badge - a rare double. Matias Almeyda scored 1 goal during the championship season. 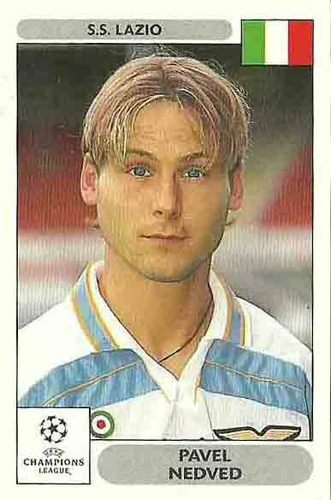 He's better known for his pledge of cutting his hair if Lazio win the Scudetto. He got to cut it all right. Almeyda's hair before being cut. 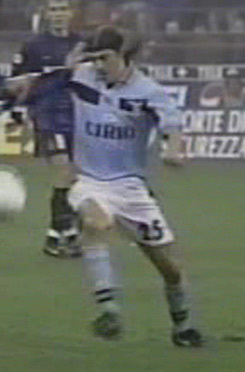 Cirio was the sponsor during their championship year. 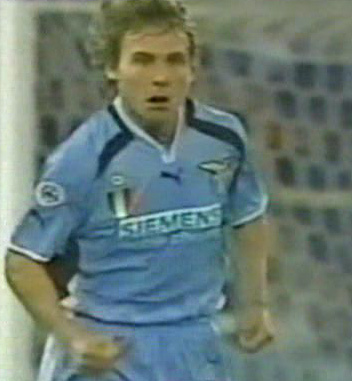 Siemens won the sponsorship and the right to associate with the Scudetto champions the following year. 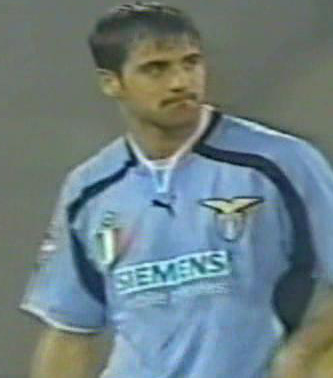 This is Stankovic in 2001. Veron with the assist - a perfectly weighted pass, met by Simeone for the game-winner against Juventus. 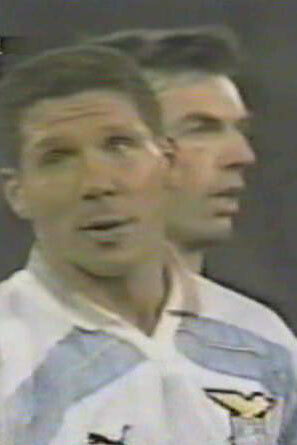 Simeone looks on about a call. He would go on to win the match on a header here at Juventus. The Simeone scoring play in the match against Reggina, final day of the season. 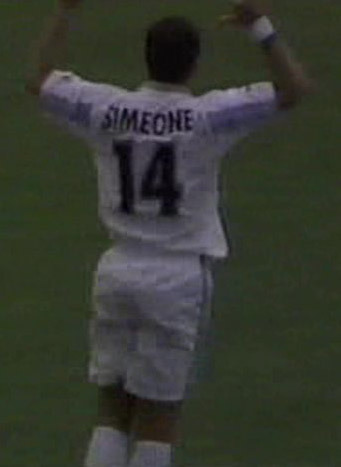 Diego Simeone celebrates his goal - a header against Reggina. 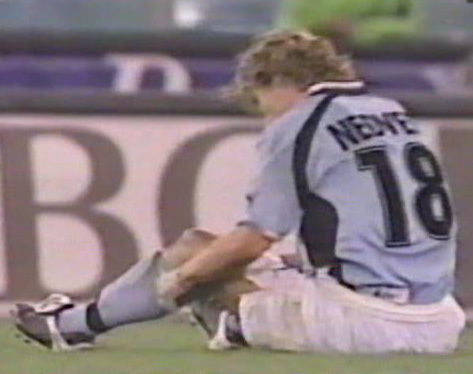 Pavel Nedved Champions League material. 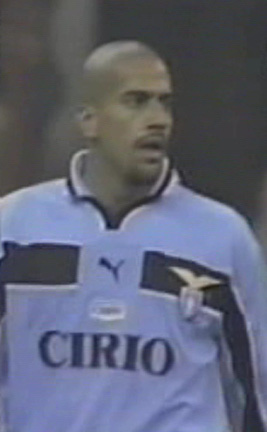 Juan Sebastian Veron was a summer signing for Lazio, a whopping 31 million dollars (US equivalent). 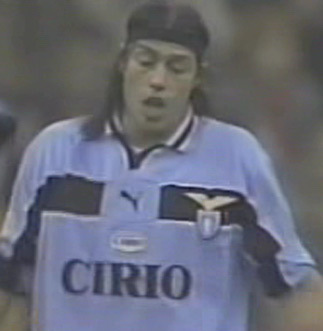 Matias Almeyda made a vow to cut is long hair if Lazio won the Scudetto. His hair got a lot shorter by the middle of June 2000. There were scenes of his teammates cutting it on the field. Diego Simeone went on to coach Atletico Madrid, taking them to the Spanish league Championship and Champions League Final in 2014.